London/Tokyo, December 6, 2018 - Inmarsat (LON: ISAT), the world leader in global mobile satellite communications, has today announced that it has entered into an agreement with Mitsubishi Heavy Industries, Ltd. (MHI) to be the first commercial customer to place an order for the new H3 launch vehicle. The maiden flight of H3 is scheduled for 2020 with Inmarsat planning to deploy the new launch vehicle after 2022. Quelle: MITSUBISHI HEAVY INDUSTRIES, LTD. In a milestone for the development program, this week Inmarsat said it is planning to deploy the launch vehicle from 2022 and become the first user of the H3. 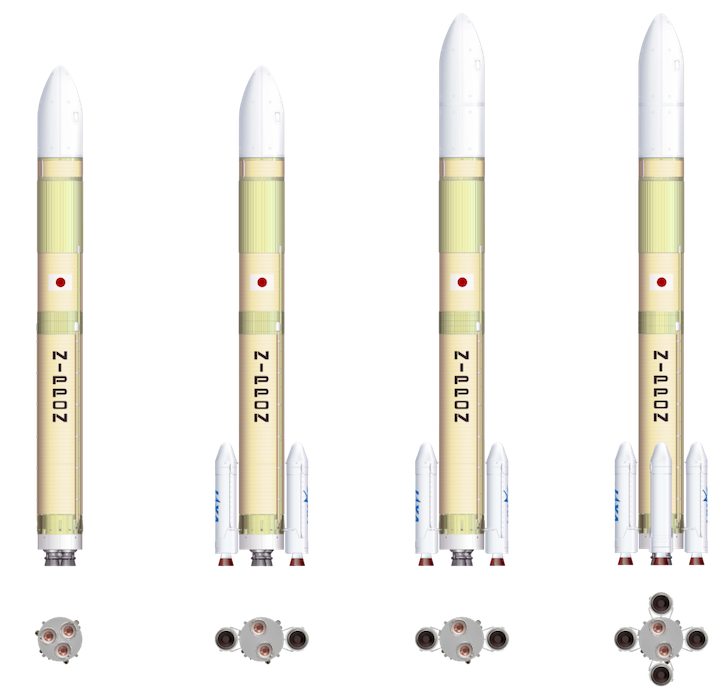 Inmarsat already uses Mitsubishi Heavy Industries’ (MHI) rockets and awarded a launch services contract to MHI for the H3’s predecessor, the H-IIA Launch Vehicle, in 2017. 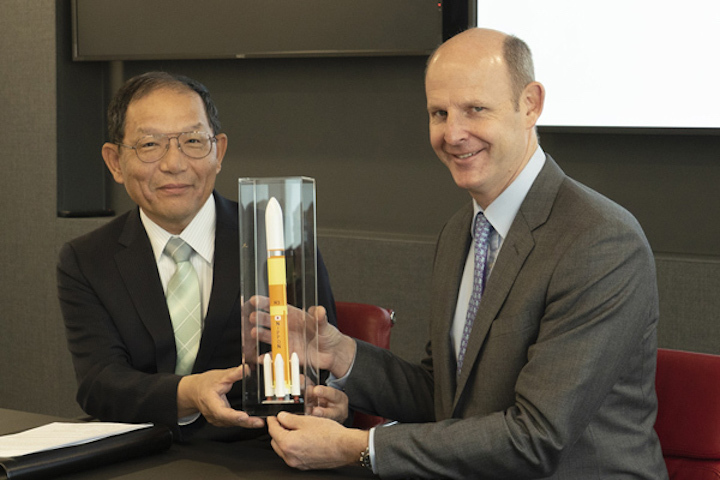 Masahiro Atsumi, vice president and senior general manager for space systems at MHI, said, “Development of the H3 Launch Vehicle is proceeding steadily under the leadership of JAXA, with MHI serving as the primary contractor working closely with key component manufacturers. Mitsubishi's new H3 rocket is now deep into development. Four configurations of the H3 rocket, with and without boosters, and a larger second stage. 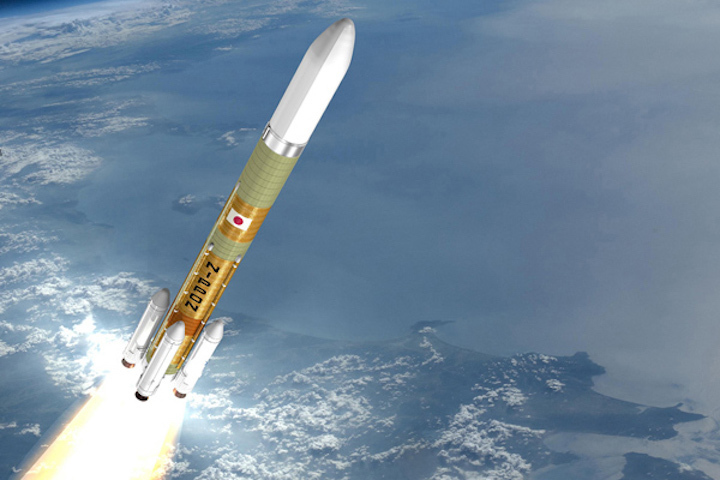 Japan's largest rocket company, Mitsubishi Heavy Industries (MHI), has received a vote of confidence as it seeks to compete for commercial launches in an increasingly crowded market. Earlier this month, the company announced an agreement with satellite operator Inmarsat for a launch in 2022 or later. Significantly, the flight will take place on Mitsubishi's new H3 rocket, which was designed and developed to fly at a lower cost in order to attract more commercial business. It was the first commercial contract for the rocket, which is set to debut in 2020 by launching a satellite payload for Japan's space agency, JAXA. JAXA and MHI want to increase the country's number of orbital launches annually from the current average of four to about eight. The only realistic way to do this is to increase launch orders from commercial companies. And as MHI has sought to do this, it seems to have found a good partner in Inmarsat. Already, in September 2017, Inmarsat selected MHI's H-2A rocket for the launch of its Inmarsat-6 F1 satellite in 2020. And now, the company has returned to MHI for a second consecutive order. This is a big win for the Japanese firm, as Inmarsat could have picked almost any number of competitors. Since it began launching satellites in 1990, the London-based satellite operator has flown on US Delta, Atlas, and Falcon 9 rockets, multiple variations of Europe's Ariane launcher, and Russia's Proton and Ukraine's Zenit vehicles. "We've always maintained a portfolio of launchers to account for unforeseen events," Mark Dickinson, Inmarsat's deputy chief technology officer and vice president of satellite operations, told Ars in an interview. The two recent launch contracts with the Japanese company reflect confidence in the reliability of its service, Dickinson said. "We have a very good working relationship with them," he said. MHI has afforded Inmarsat good visibility into the technical development of the H3 rocket, both the successes and challenges. This raises confidence that the H3 rocket will be ready in 2020, Dickinson said. He added that the insurance market is favorable toward the H3 and that the vehicle is seen as an "important and significant incremental step forward" to lower costs and improve launch cadence. In a separate interview, Ko Ogasawara, the vice president of MHI's space system division, said development of the H3 rocket is coming along well. The company has been conducting multiple firings of the LE-9 rocket engine that will power the first stage and has also begun successfully testing the solid fuel rocket boosters designed for the H3 launcher. Next year, he said, MHI will move into testing the first and second stages, with a hold-down test of the launch system at the very end of 2019 or early in 2020 at the Tanegashima Space Center in southern Japan. The Japanese government has funded the H3 rocket with the goal of launching it for the first time in 2020, although a month has not yet been determined, Ogasawara said. He is mindful that Tokyo is hosting the 2020 Summer Olympics from late July to early August and that a launch around that event would capture some of the world's attention. But a lot would have to go right to meet such a target. (Ogasawara just laughed when asked if he was targeting a launch during the Olympics). Ogasawara did acknowledge that Japan is coming to the commercial satellite launch market at a difficult time. Not only have orders for large geostationary satellites fallen by about half, to less than 10 per year, but he must compete against other emerging, cost-competitive rockets. Aside from SpaceX's existing Falcon 9 and Falcon Heavy rockets, United Launch Alliance (Vulcan), Blue Origin (New Glenn), and Arianespace (Ariane 6) are all developing rockets for debut in 2020 or 2021 that will go after the commercial market. "Yeah, we have many competitors," Ogasawara said. "We should compete anyway. Our market is now changing. Big satellites for geostationary orbit, the number is diminishing. At the same time, small satellite programs, such as constellations, are spinning up all over the world. That is good news for launchers." Like the recent SSO-A launch on a Falcon 9 rocket, coordinated by Spaceflight, MHI will work to develop a dispenser that can fly two or perhaps many more satellites into space at a time.